Learn more about how our guides can save you money AND be an environmentally conscious alternative to your disposable products. Informative and interesting articles included in our monthly newsletters. 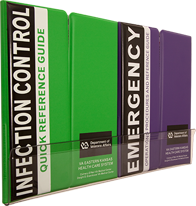 The Guide to Guest Services™, The Guide to Emergency Preparedness™ and The Guide to Infection Control™ all can be conveniently stored and displayed with our guide accessories. The Slimline Wall Mount allows the Guides to be hung from the wall, which frees up table space and makes the display more visually apparent and appealing. This particular mount allows you to hang the Guide flush against the wall. This saves space in smaller areas. The Table Stand allows the Guides to stand on a table to take up less space and to be more visually apparent and appealing. The Hook Mount is an adhesive backed hook that secures our hanging Guides to a wall. These hooks are 3M Command™ Strips. The Double-Wide Wall Mount allows the Guides to be hung from the wall, which frees up table space and makes the display more visually apparent and appealing. This particular mount allows you to hang the Guide flush against the wall. This saves space in smaller areas. It will also hold two Guides to display multiple books such as an Emergency Preparedness Guide and a Guide to Guest Services. Velobind™ bindings are available as an option on our vinyl guides. Whether you like the look of the Velobind™ binding or have a safety issue with coil in your facility, we can accommodate your needs. 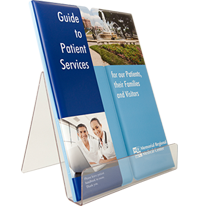 Fully customized vinyl information directories for your patients and their visitors. They are easy to update and easy to use. 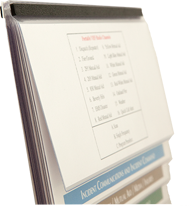 Fully customized quick reference guides to help keep your staff prepared for emergencies. Fully customized quick reference guide to help keep your staff prepared for safe infection prevention and control procedures. Protect your investment by utilizing one of our various mounting systems. © 2019 GCC. All Rights Reserved. Contact the Webmaster.